Salaam’s and welcome back to the Halal Blogosphere where we have gone all Italian or as they would say in the West End Mama Mia! Today the Halal Food Team ventured back into the Balti Triangle of Birmingham but this time we were not in search of baltis, currys or kebabs. We were here to try Birmingham’s newest Italian Restaurant La Favorita. Now the last time we had an Italian restaurant open in the Balti Triangle it mysteriously disappeared like ships sailing into the Bermuda Triangle only to resurface from the dead as Desi Express! Pasta Di Piazza La Favorita Restaurant to give it it’s full name is located on Alfred Street just off the Ladypool Road in a purpose-built double storey building with a generous glass frontage that initially seems slightly out-of-place in a side street in Sparkbrook. Having said that I am all for investment in local communities and with the opening of Mughal E Azam in Sparkhill, Haveli in Small Heath, Yaqub’s Steakhouse down the road on Stoney Lane and now La Favorita its great to see real investment in contemporary halal restaurants in the heart of Birmingham’s Muslim communities. I’m a firm believer that for areas like Sparkbrook and Small Heath to thrive in the current challenging economic times it is paramount for local businesses and individuals to support inward investment at a time when the local authority only has eyes for the city centre. Thats enough social commentary for now let’s get back to reviewing food! As you walk into La Favorita you walk into one of the most delightful interiors of any halal establishment in Birmingham. It doesn’t have the grandeur of Mughal E Azam but the interior is contemporary, fresh and welcoming. Walking in on a cold January afternoon you instantly feel the warmth of the restaurant. The restaurant spans two floors and the covers are generously spaced out ensuring diners can have an intimate dining experience without having to overhear every conversation of diners in the near vicinity. As you enter the restaurant the drinks and desserts counter is located to your left and you have an open view into the kitchen at the back of the restaurant. We were warmly greeted by the staff and accompanied to our tables and were promptly offered our menus. What is unique about La Favorita is that not only is it an Italian restaurant it also offers a full Balti menu which I did find rather strange but the restaurant has ensured both menus are unique and distinct so that you don’t get caught in the middle of an identity crisis. For the purpose of our review we were strictly here to sample the Italian menu. For starters we ordered the Funghi Con Aglio which translates to Mushrooms with Garlic, Tomato, Cream and topped with Cheese, the Garlic Bread with a tomato dressing and we decided to share a pizza between the three of us choosing the Rustica thin crust pizza which came with the following toppings of Tomato, Cheese, Spicy Beef, Onion and Chicken. The starters were impressive with the Funghi Con Aglio the undoubted highlight. Each mouthful delivered a rich experience, the button mushrooms were perfectly cooked with the flavouring of the garlic providing the perfect taste sensation which was complimented beautifully by the rich sauce and cheese. The garlic bread was freshly cooked blended with the rich flavours of the tomato dressing and the rustic pizza was served on a thin crust and was light on the palette. 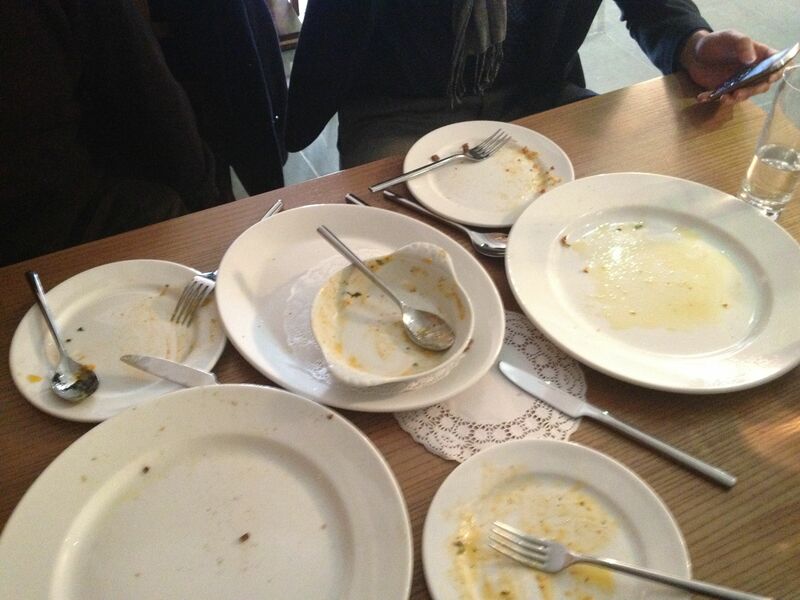 The evidence of how much we enjoyed our starters can be seen by the rather telling picture below and the big smile on the waitress’ face when she cleared away our plates! The starters had definitely delivered! The customer service at La Favorita is excellent, the service was prompt and the waiting staff were polite and professional. With the rarity of halal traditional Italian dining in the city the menu will be very new to a lot of diners and if there is one area we felt service could be improved is for the staff to be more forward in terms of offering recommendations from the menu as we did struggle initially to decide what to order. For our mains we selected the Pollo Pomodoro (Chicken Breast served with mixed Peppers, Chillies and Garlic cooked in a Tomato sauce with fresh Oregano) served with a side of Sauteed Potatoes, the Canneloni (Rolls of Pasta filled with Mince Beef and Vegetable Béchamel, Tomato Sauce and Cheese) and finally the Risotto Rotara (Rice with strips of Chicken, Seasonal Vegetables, Garlic, Onions with a hint of Tomato) For at least two of us this was taking us into a completely new dining experience and we couldn’t wait to try the mains after the delightful starters! 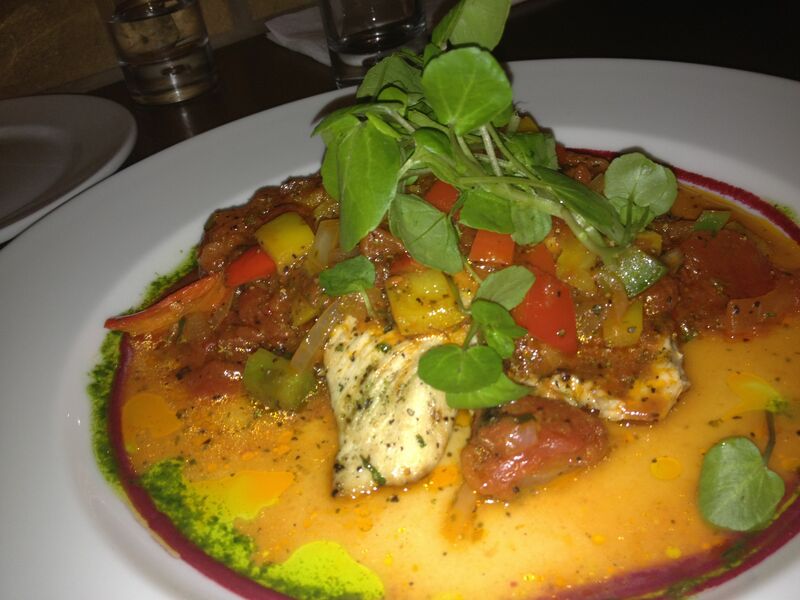 The mains were beautifully presented with the star award going to the Pollo Pomodoro which came in a beautiful sauce which was complimented by the rich colours of the peppers and vegetables. The risotto was accompanied by a decorative beetroot sauce. It was at this point we encountered the only glitch of our dining experience where instead of the Cannaloni we were served with Crespolini(Rolled Pancake filled with Ricotta Cheese, Spinach, Garlic, Chillies, Cheese, Bechamel and Tomato Sauce) The waiting staff could not be more apologetic and assured us that the Cannaloni would arrive within a few minutes. Not ones to miss an opportunity we offered to consume the Crespolini too and were delighted to hear that we would not be charged for the extra dish. Small touches like this make a big difference and also allowed us to try something we probably wouldn’t have considered on the menu and full credit both to my fellow diner for making the suggestion and to La Favorita staff for offering us a generous freebie. Each of the mains was once again a feast for our taste buds, we mixed and matched our mains and there was no weak point that we could identify. 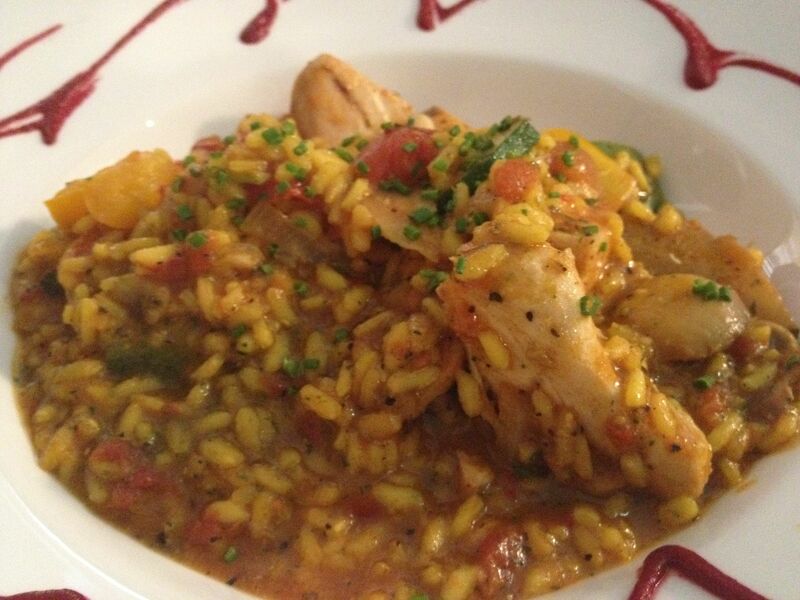 The risotto was served al dente just as we had requested, the chicken in the Pollo Pomedora was cooked to perfection and the sauce it was served in was rich in flavour and texture! The cannoloni delivered too with delicious mouthfuls of pasta and beef bathed in a rich sauce and cheese topping. La Favorita certainly delivered. Our dining experience was incredibly positive and we also encountered even more of a rarity which is gushing praise from three of the most demanding tasting palettes on the Halal Food Review team! Towards the end of our meal the chef also introduced himself to us and shared his thoughts on the menu as well as getting our feedback on the food. The human touch of a dining experience can never be underestimated and we found the team at La Favorita to be warm and generous and this was topped off by a complimentary selection from the patisserie counter. If we had to look for faults or suggestions for improvement we would welcome a serving of bread, dips and oils at the start of the meal for the full Italian dining experience. At no point did we look at the Balti menu and it will be interesting to see how diners take to the dual cuisine offer at La Favorita, the Italian option is more than enough to make the Halal Food Review team come back for more. The only other complaint is one we have to blame ourselves for, having eaten so much we didn’t leave any room to fully sample the dessert menu but we will definitely be back to tackle the sweet side of the menu! In summary La Favorita delivered a wonderfully rich Italian dining experience, the food was faultless and the service was of a really high standard. The total bill for our meal came to just over £40 which would have been higher if we had ordered more drinks but only one of our dining party had a soft drink whilst two of us stuck to water. The portion sizes are generous both for the starters and the mains and the prices represent very good value for a totally unique halal Italian dining experience that is not available anywhere else in the city. We would definitely recommend La Favorita to all our Halal Food Readers, and would welcome reader thoughts particularly on service during a busier evening dining period as we ate after Friday prayers when the restaurant was quiet. La Favorita should definitely be at the top of your places to dine list and we’d encourage our readers to experience the true breadth of the Italian menu on offer. La Favorita has certainly knocked Mughal E Azam off the top of our favourite places to eat in Birmingham chart and we can’t offer any better compliment than that! What do you get when you have a Halal Food Reviewer, an International Comedian and a video crew? You get a Sameer’s Eats video special with Aman Ali who many of you may recognise from his 30 days, 30 days mosque project and his recent trip to the UK. So sit back, get the popcorn and enjoy another special edition of Sameer’s Eats from Stateside! 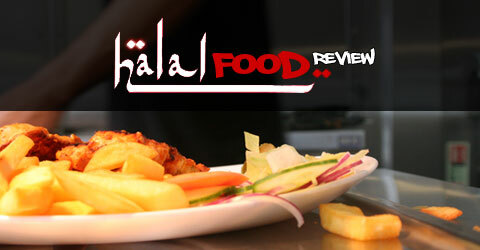 Send us your halal food comments, photos and videos! Salaams from a very cold Monday morning in Brumistan! A quick blog update this morning to encourage readers to send us their photoso of their halal food experiences. 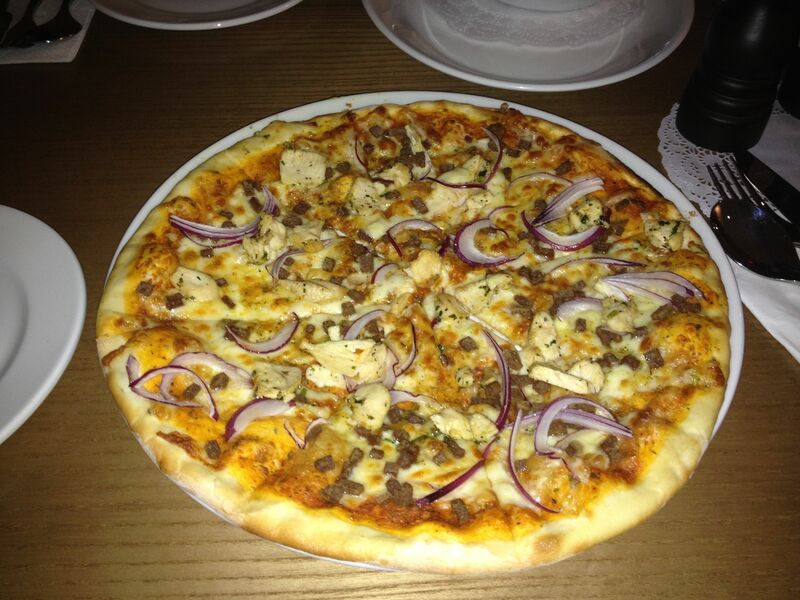 They say a picture tells a thousand words and we’d like to see what our readers are eating when they are out and about. If you would like to share photos please use our social network channels on Facebook and Twitter so that you can connect with our wider Halal Food Review community. Its a wonderful way of finding out about new places to eat, places to avoid as well as being part of a wider conversation that we can’t always replicate via the website. We will be sharing reader photos via the website on a regular basis too. So now its even easier to be an active part of the Halal Food Review community. You don’t have to write reviews just send us your photos! One final note, we’ve added sharing buttons to all our posts so please do share the Halal Food Review website with family, friends and colleagues. The wider our reach the more diverse we can make our content. If you haven’t joined us on Facebook or Twitter it only takes a moment. Until the next time, happy eating! Categories: BIRMINGHAM, Halal Food Review Social Media . Tags: Halal Food Review Facebook, Halal Food Review Twitter . Author: halalfoodreview . Comments: Comments Off on Send us your halal food comments, photos and videos! Over the coming months we will be bringing our readers a series of exclusive discount vouchers and special offers for halal food restaurants across Birmingham and inshallah nationally across the UK. This is an opportunity to thank our readers for their continued support over the last couple of years and inshallah you will continue to benefit from the site in the coming years. To help you keep up to date with any exclusive vouchers or special offers you can follow us on either Facebook or Twitter so that you don’t miss out on any time limited special offers. Keep you eyes on the site over the next few weeks for the first of our exclusive reader offers.